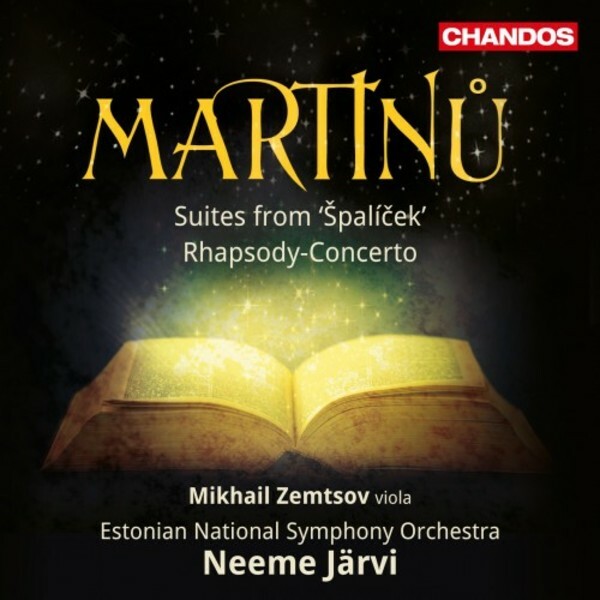 This album with the Estonian National Symphony Orchestra and its artistic director, Neeme Järvi, features two mature works by Martinů, recorded in the splendid acoustic of the Estonia Concert Hall in Tallinn. One of the most wide-ranging composers of music for the stage, Martinů was also enthusiastic about the theatrical possibilities of including new media in his operas. Špalíček in many ways belongs to this experimental tendency. Although it was published and billed at its first performance as a ballet, it might best be described as an opera-ballet, as alongside the many dances there are extensive roles for chorus as well as tenor, soprano, and bass soloists. Martinů described the work on his manuscript as deriving from folk games, customs, and fairytales. The lyrical Rhapsody-Concerto was written in 1952, at a time when Martinů was fighting homesickness and depression, worsened by the political situation in his native Czechoslovakia. The work is a marked move toward a more romantic sound world. The soloist here is Mikhail Zemtsov, principal violist of the Residentie Orchestra The Hague since 2001 and a prize winner at the first International Viola Competition (Vienna) and the Elisa Meyer String Competition (Hamburg). The exploration by Järvi and the ENSO of hidden gems from the late nineteenth and early twentieth centuries has proved highly successful, their recent recording of works by Suchoň (CHAN 10849) awarded the Choc de Classica.